Useful when you want to assess your status in relation to the Standard, but need some help. A 'Do It Yourself' ISO 9001 checklist of questions in clear, plain English, with plenty of guidance so you understand them. Supplied as electronic downloadable files: the Checklist template in Word format so you can edit and change it, plus PDF format for convenience; the example Gap Analysis as a PDF file only. Use this clear checklist and guideline to evaluate your status against the requirements for ISO 9001: 2015 and find out where you are now. Work through the questions on the checklist, using the prompts and examples to establish your current status. The requirements (what the Standard says you must do or have) are translated into clear English. Questions and notes plain English. None of that 'ISO gobbledegook' so you won't need a degree in "quality speak" to follow what I say. Benefit from my years of consulting experience in many different companies, with the Standard, with quality management systems and with making things easy and comprehensible. NOTE: if you plan to buy the the 2015 Transition Kit, don't buy this as well because it is included in the Transition Kit. Sample: Use this link to view sample pages from the Gap Analysis Checklist (*pdf format). Use it to benchmark your business against the international ISO 9001 Standard, for a fraction of the cost of having it done by a professional. Immediate download - get started right away. *Note: The Australian publication of ISO 9001: 2015 was not published until 5 months later, in March 2015. Because of this, the Australian publication has the title of ISO/AS/NZ 9001: 2016. Ignore that - it is exactly the same Standard. When you need an expert analysis by an experienced and professional quality management consultant. 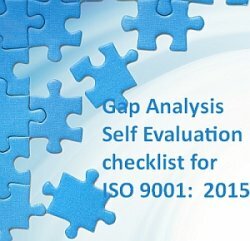 What you get: An assessment by an expert, delivered as a succinct and clear report in plain English that summarises your current status against the relevant requirements of ISO 9001, identifies the gaps, and lists all the tasks required to fill your gaps and achieve ISO 9001 ready status. Cost: Usually in a range of $1200 - $2000, but depending on company size and complexity.